If you thought that drinking was cool before, then here is something that would make it feel even cooler – literally speaking, of course. I am referring to the 24.99 Chillsner Beer Cooler which would make your drinks all the more cold. In fact, the Chillsner Beer Cooler can be said to be the first in-bottle drink-through beer chiller in the world, which means you do not have to go through the experience of having warm beer on your tongue ever again. There is nothing that tastes worse than that where beer is concerned, although I have not lived out the idea of boiling hot beer just yet. The Chillsner Beer Cooler will be able to freeze in a jiffy, which means it will also chill perfectly and can be cleaned easily. Not only that, it comes in a sleek and stylish stainless steel design, making it look a whole lot less geeky and more suave. How does the Chillsner Beer Cooler work? 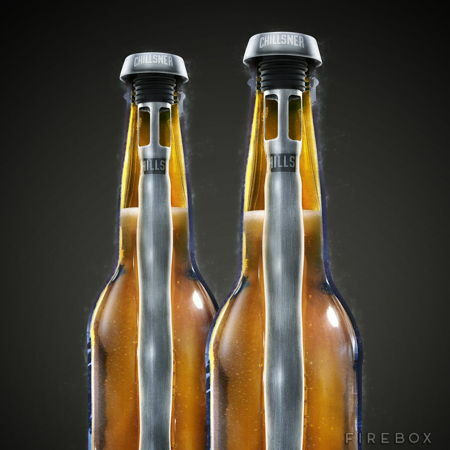 Well, there is a thermal gel that remains sealed within its sleek steel body, allowing it to remain lovely and frosty for a whole lot longer without diluting your favorite pilsner. After it has been inserted, a quartet of large flow vents will be able to deliver a smooth and consistent stream of ice-cold perfection. Pressing it downward to turn the Chillsner into a handy airtight seal so that your beer would not end up flat, either.